Even though most of the Chinese movies doesn’t get much popularity around the world, Chinese Kung Fu movies are loved by millions of people worldwide. When talking about Chinese Kung Fu movies, Bruce Lee and Jackie Chan are the name that flash our mind. Actually, other than these two stars, IP Man is another popular Kung Fu character in the IP Man film series. IP Man 1/2 and the newest IP Man 3 are biographical martial marts movies in the Chinese language. For people who don’t understand Chinese, it may take some efforts to grasp the story while watching IP Man 3 dubbed in Chinese. Well, there is another option to get what the movie is about – download IP Man 3 full movie with English subtitles. In this post, we will introduce 5 best websites to download IP Man 3 full movie English subtitles, as well as how to add the downloaded subtitles to the video with third-party tool. Moviesubtitles is one of the best choices for downloading free movie subtitles. Here, you will find subtitles for the most popular movies, TV shows and they are available in multiple languages. All subs are packed and stored with the help of the WinZip, and you need to unpack them in order to use them. If you make your own subtitles, you can easily share them with others in this website. Subscene is our preferred source for downloading IP Man 3 full movie English subtitles. It has a simple and straightforward interface and is very fast to use with a useful search function. You can easily find the subtitles you need by typing the show or movie title in the search bar. Besides, this website is always kept up-to-date with subtitles for the latest films and TV episodes, and nearly all the subtitles are in SRT format. This website is another good source for free subtitles. It is quite useful to search the English subtitles of IP Man 3 full movie. At Subtitles HR, all subtitles are named and listed alphabetically to make your searches easy. Alternatively, you can search for subtitles you need with its user-friendly search button. Open Subtitles is another great website where most people go for their subtitles downloading needs. It is the largest subtitle database which offers more than 820,000 subtitles for DivX movies, and support for dozens of language. As well as other websites, it provides many convenient and advanced features, such as the dedicated Request Subtitles page, the in-depth search filters, the embedded third-party information and relevant links for free streaming movies. SubDivx is one of the leading websites for downloading subtitles of the latest DivX, DVD movies and HDTV etc. Also, you can contribute by uploading your subtitles. The interface of this website is pretty simple. But you need register an account to start downloading or uploading files. Above are the 5 best sites to download English subtitles which will certainly help you in enjoying the IP Man 3 full movie. Now it is the time to add the downloaded subtitles to the movie. There are many subtitle adding programs available to do the task. Here we strongly recommend Gihosoft Total Video Converter. 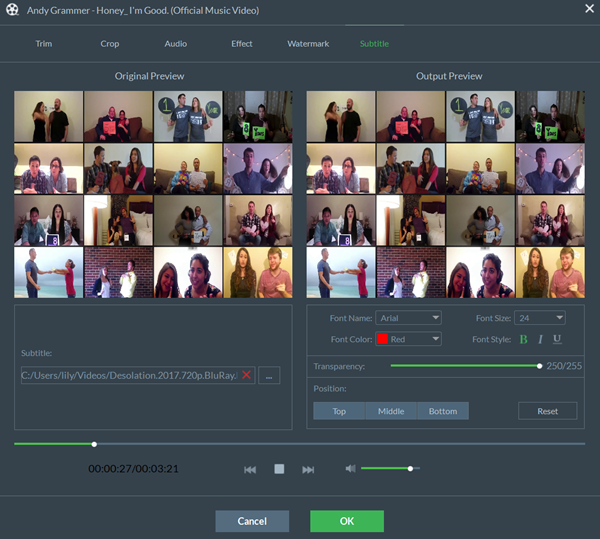 It is very simple to use, and you can embed subtitles to video in a few clicks. Just follow the steps below to add English subtitles into IP Man 3 full movie. Download, install and run Gihosoft Total Video Converter software on your computer. Click on the “Add Media” button under “Convert” tab to import the IP Man 3 full movie. Click on the Edit icon and in pop-up editing windows, choose “Subtitle” on the menu bar. Now click on the “…” button to add the downloaded IP Man 4 full movie English subtitles. After that, click on “OK” and choose your preferred output format, then click “Convert”.